Relax at Branson Missouri Cabins. Rustic & World-Class Entertainment in the heart of Branson, Missouri. The Diva’s Half Marathon and 5K Series are some of the exciting activities in Branson to enjoy this coming May 13 to 15, 2016. The event is the largest women’s half marathon series in the U.S. for a weekend of entertainment, and of course … Divas. For the first time ever, the Divas4Good Weekend activities in Branson will provide an opportunity for Divas all over the Midwest region to support health and wellness for women in the Ozarks with a fitness expo and boutique, a free concert, and running events. The festivities will officially kick off on Friday May 13 with a free concert featuring country singer and songwriter Candy Coburn and the Health & Fitness Boutique filled with kiosks and shops. The events on the following day, Saturday May 14 will include the Health & Fitness Boutique provided by DIVAS, the Skaggs Foundation, and Divas4Good. On Sunday, May 15 is the final day of the event and the Half Marathon will start at 7:45 am while the 5K Series will follow at 8:15 am. Along the course, participants for the two events will get to enjoy live entertainment stations. All runners will be offered a race tee shirt, boa, tiara, and the beloved pink tutu, as well as crown-shaped finisher medals. Whatever activity you want to enjoy, whether you jog, walk, run, or race, don’t miss to join thousands of ladies across the U.S. this year in Branson by participating in the DIVAS half marathon or 5K on May 15. This annual event is not about who finishes first, and it isn’t about winning a prize – it’s about showing your support for women’s health and wellness and showing the world the meaning of running like a Diva. 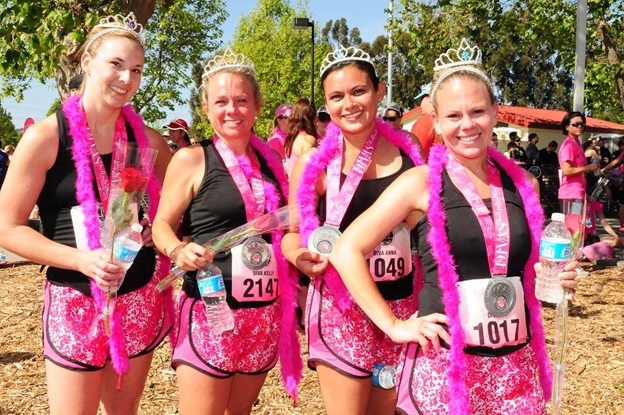 This running event is one of the most fun activities for glamorous women in the country. Get glam at one of the races while enjoying a great run in one of the country’s best vacation destinations: San Juan, PR; North Myrtle Beach, SC; Long Island, NY; San Francisco Bay, CA; Galveston, TX; Peachtree City, GA, DC’s Wine Country, VA; St. Augustine Beach, FL, Temecula, CA; and Branson, MO. On the final day of the event, the run will begin in Branson Landing Blvd. and wind down at Branson Landing with spectacular views of the Fountains, Lake Taneycomo and historic downtown Branson. It will then head north through scenic streets, Stockstill Park and finishes back at Branson Landing lakefront by the Fountains. The route is a flat terrain stretching 5 miles, 4 miles of uphill terrain and 4 miles of downhill terrain. The first 2.5 miles of the route are flat and winds down the waterfront, and gradually climbs 324 feet over the next 4 miles. Upon reaching 6.7 mile run, it’s all downhill at 10.7 mile and staying flat until the end. The Diva’s Half Marathon and 5K Series are some of the great activities in Branson that will be held for the second time this coming May where glam women will run like a Diva.